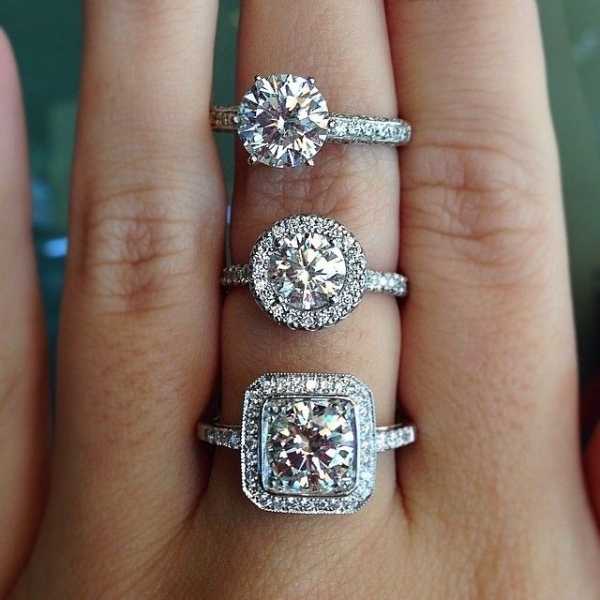 Custom diamond engagement rings and wedding bands. Over 750 examples of custom made jewelry on our site. Top Google, FaceBook, and Yelp reviews. You are about to make that exciting life long decision to get married. You want to make the perfect proposal with the perfect ring. Never fear! We make picking out an engagement ring simple and fun. If you decide to be super hero and have a engagement ring custom made then we have a few pointers for you. You can get her ring size a couple of ways and not spoil the surprise. One is to sneak a ring away from her and have us measure the ring size. Another is to try on a ring she wears and note where the ring stops on your finger. You then bring your finger (along with the rest of you) into our store and we will let you try on ring sizers until you find the right one that stops at the same point. If you plan on having her input on the engagement ring design then let us measure her finger. Measure twice, cast once. Pay attention to her comments on engagement rings in our store. Women love giving hints. Men seldom get them. Almost every women has a preferred diamond shape. We advise that you have an idea of what she likes. 80% of all engagement rings sold have a center round brilliant cut diamond. However we are seeing trends to other shapes recently such as pear shape. We are also seeing engagement rings made with gemstones such as Morganite, Emerald, Ruby, Sapphire and more. There are many different mounting styles to choose from. It can vary from the simple solitaire to the popular halo design or even the antique/vintage look with hand engraving. Do you add diamonds down the shank? Do you go with a wide or narrow profile? Tall or set low as possible? If you choose the custom route we are able to blend a variety of styles into one design. Never fear, we make this part easy. It is at this point you come and see us for a free consultation. We will help you sort out these details. Since we design with CAD on the computer, you get to see what it will look like before we even start working in the metal. View our custom gallery of over 700 designs we have done for our clients!